50+ Lifestyles » How do I Succeed with my Hearing Aid Technology? How do I Succeed with my Hearing Aid Technology? Many people admit their struggles with hearing aids. Some people even give up with their technology. With that being said, New Year’s Day is a perfect time to resolve to get the most out of your hearing technology, assuming it is fairly current and working well. For the best success, start by scheduling an appointment with your audiologist and follow their advice. Or, get a second opinion from an alternative audiologist. This will begin an ongoing conversation throughout the year. At that initial appointment, bring your family with you so THEY understand your hearing loss! Hearing better is a process, much like a new exercise plan. The initial focus of the conversation will be on your hearing loss. You may receive a hearing test. You may even be told that you need new hearing technology. Try to have a list of questions ready… Asking “Why” is always helpful. Ask to have information written down. Realistic Expectations are key. It helps to know that those first one to three weeks, your audiologist is trying to change what your idea of what “normal” sounds like with your hearing aids. Remember: To help with hearing loss, we have to make sounds louder in order for you to hear better. Your idea of normal will change as you use your new “ears” after the first week. Your family should understand that your hearing loss is their problem, too. Talkers and listeners are a team with two different job roles: talker and listener. Negative strategies do not work; shouting distorts your speech, and walking away while repeating for the third time does not help. Outcomes: In the end, it is important to understand your hearing loss and your own realistic expectations. Your personal outcomes are an ongoing discussion. Like a new diet, the benefits of using your hearing aids may not be fully realized in one meeting; hearing better is an evolving process that continues over months and even years. 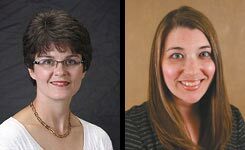 Dr. Elizabeth Meinecke and Dr. Molly Parker are currently accepting new patients at Parker Audiology, P.C. Call for an appointment at (563) 326-5441.